The April 2007 meeting was called to order by President Jim Cook. The turn out was on the small side: 6 members and 1 guest. The treasurer's report was given by Jack Putnam. Membership dues are still being accepted. On the project side of the meeting: The members present worked on the leaking NH carburetor of Bob Torbet. The final answers did not come until three days later (members at the meeting did not have the answer). After torching out the old seat and replacing it with a new/used seat and needle, it is working,,,thank you Jack. We also went over the new spoke project of Jim Cook's wheels. They are being made by an Amish wheelwright in Holms county. Jim said that you can't beat the price; but, you spend a lot of money in gas trying to find the place. Jack Putnam had received a timing device that is being produced by someone else for testing. The members checked it out on an engine that Jack had on his test stand. We did not take a vote on its ability to perform and not sure of the price tag. The first tour of the season will be the Shakedown Tour at Indian Lake on May 20. We will meet at the parking lot at the State Park on State Route 235 on the west side of the lake at 10 AM. The tour will be the same as last year with one added stop. We will be stopping at a car museum where you can make a pit stop before lunch at the Tilton Hilton. This tour will run rain or shine. We will be back at the State Park before 3 PM. Jim Cook is putting together another tour of the Tiffin area, this was very good last year and Jim plans on adding more for this year. The date has not been set as of yet. Every engine builder has had his share of messed up engines from oil starvation. 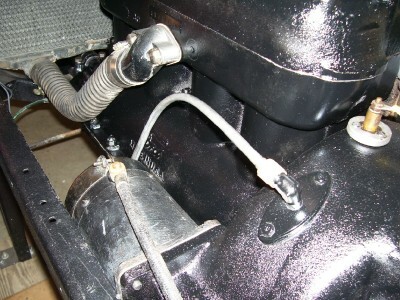 The traditional oil return runs from just inside the transmission housing to the front of the engine, just behind the cam gear. This oil line is prone to clogging by lint and other debris in the oil. Many engines have been equipped with oil screens that fit just under the transmission inspection plate. These things really collect the junk floating around in the oil. 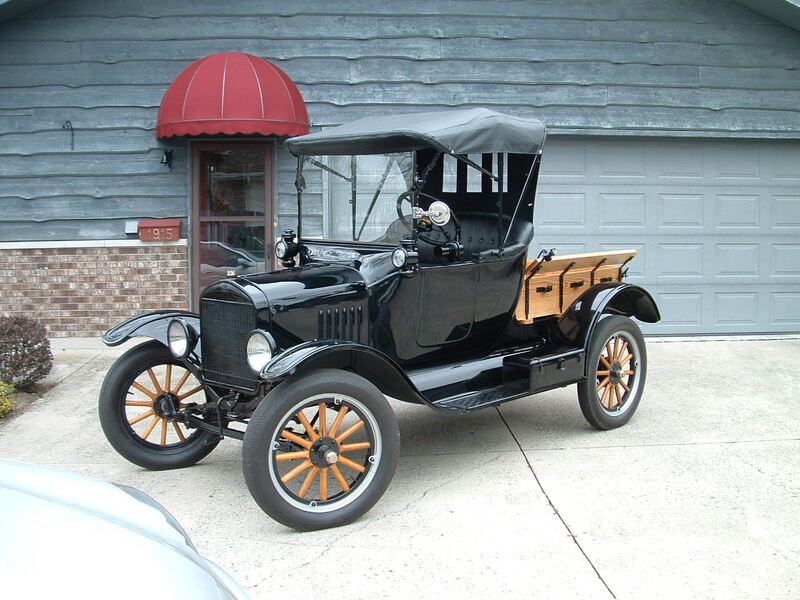 Model T era is the auxiliary oil line. 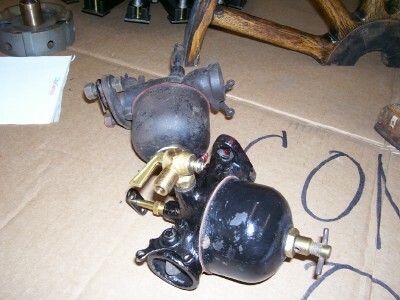 These came in a number of variations from the traditional mag post lines to the inside oil pan lines. 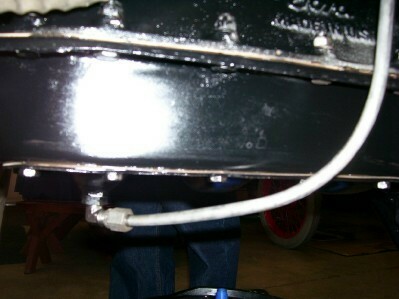 The variation that is pictured here ran from just to the left of the mag post to the first sump under the number one rod. This system can double the amount of oil flowing to the front of the engine. The drawback is that any work on the transmission cover or engine inspection plate requires the removal of the associated fittings. 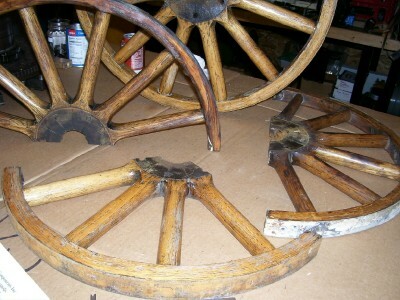 A recent teardown of the aged wheels on Old Henry demonstrates some of the variation in wood felloe wheels of the time. 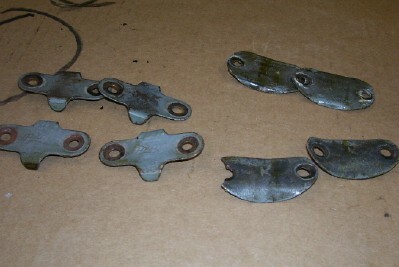 The top picture shows sections of the four wheels removed from the 1916 and then separated from their hubs and rims. I must conclude that some of the wheels have been changed over the years. We know that at least two of the wheels were changed because all of the wheels are set up for 30" x 3-1/2"; and, this is not a Canadian car. The rear drivers side wheel was corrcct with the rounded felloe and oval spokes. This wheel also had the Kelsey felloe plates. The other wheels had combinations of square felloes with either oval or round spokes. The different felloe plates can be seen to the right. Each set was different (Ford +, Kelsey, Kelsey +, Oval blanks). They are all being replaced with oval felloes, oval spokes, and Hayes plates. Bob had a leaky carburetor at the last meeting that would leak sometime and not others. We had it apart and looked at the seat. It looked to be out-of-round. With enough air forced through it, it would seat and hold air. After a few adjustments of the level it was determined that the float was not the problem. By this time the gasket on the bowl was the issue. The seat ended up being the problem. Its now fixed. We also had a little fun testing a gizmo for setting the timing on a Model T. Jack had one of us follow the instructions to see if we could use the device and the porvided instructions to set the timing. The instructions were clear enough. But, the resulting advance rod postion did not end up where we wanted it to. Some minor adjustment was needed to get the correct Top Dead Center and the needed retard for starting. It was a great experience. Fri June 15th 5PM to Dark - Cruise in at Bluffton, Park on Main street. Best to be in line by 3:30. Always a crowd pleasing event. Here is the real reason to attend the NWO meetings. 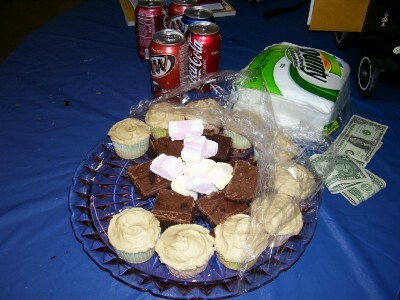 Marilyn always provides a great feast for the sweet tooth. Members throw a little cash on the table; but, it is just collected for little extras that go back to the club. As always we depend on the membership to bring in their favorite sodas on occasion to replenish the supply.